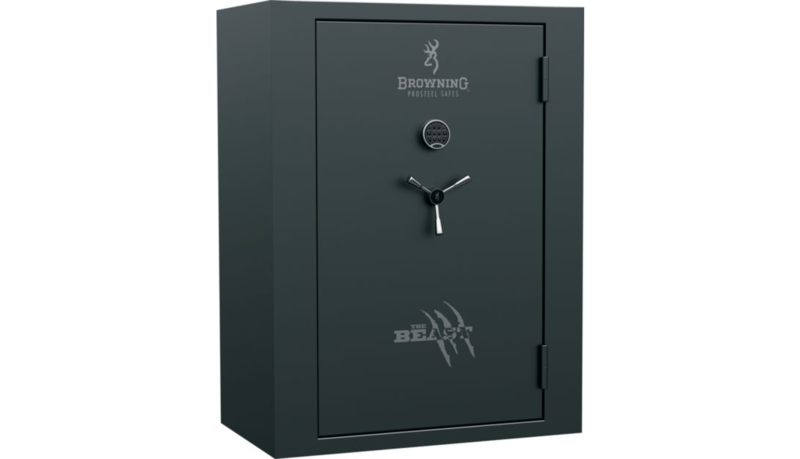 Browning’s The Beast Gun Safe is the latest addition to their Heavyweight line. 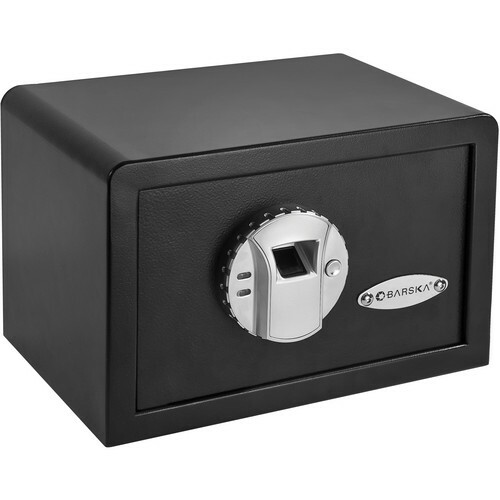 Extra-wide interior locks up your long guns, handguns, jewelry and important documents behind a virtually impenetrable barrier against fire and theft. 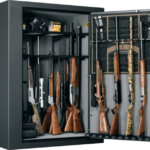 Spacious interior holds up to 56 long guns between the high-capacity barrel rack and the DPX storage system on the door panel, while the adjustable cantilevered modular shelving provides a variety of storage configurations, eliminating the need for vertical shelf support. Pry-stop end bolts extend into the 12-gauge steel body more than 1.5 times deeper than traditional bolts and attach to angle iron, preventing thieves from bending the support bar in prying attacks. Force Deflector™ Locking System uses a rotating cam device to prevent bolt or handle forces from reaching the SecuRam electronic lock. Chromed 1″-dia. 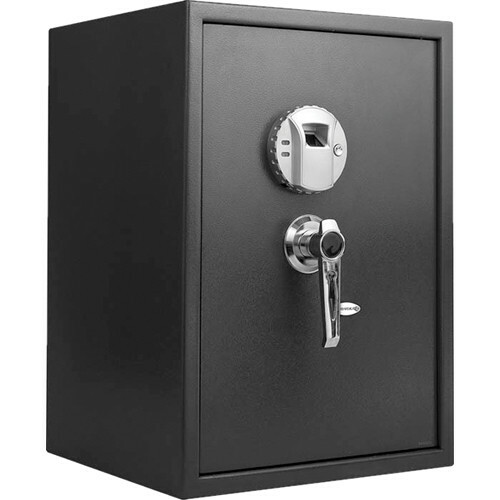 locking bolts on three sides of the 1″ formed, inner-plated door, including at the top and bottom corners, provide additional protection. ThermaBlock fire protection prevents up to 1,400°F heat from reaching your valuables for up to 60 minutes. Eight total locking bolts, five active locking bolts. Elevated floor protects gun stocks. 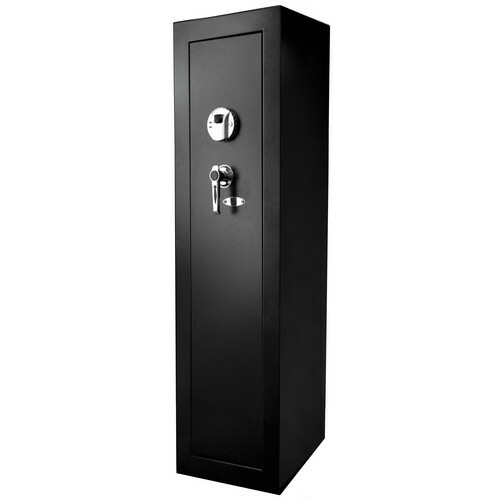 Includes a quality matte-black finish, three-spoke black chrome handle, beige fabric interior, 1″ insulation in the door and body, and 1.5″ in the ceiling. 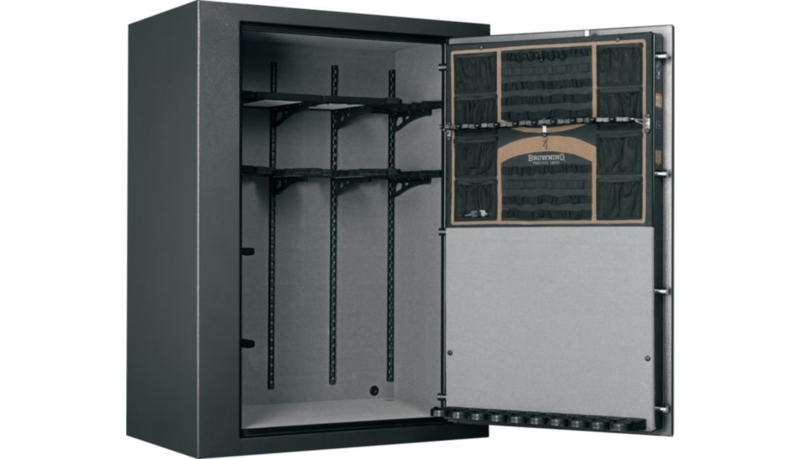 Storage options include four barrel racks, two pistol racks and eight shelves. Exterior: 58″H x 44″W x 27″D. Interior: 54″H x 41″W x 20″D. 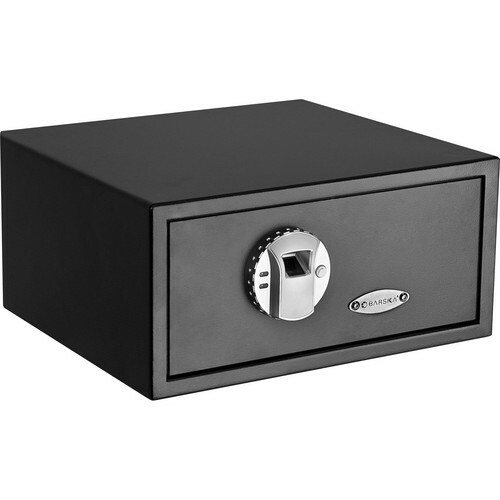 Store your firearms, ammo and other valuables with peace of mind in Browning’s Black Label Mark IV Gun Safe. 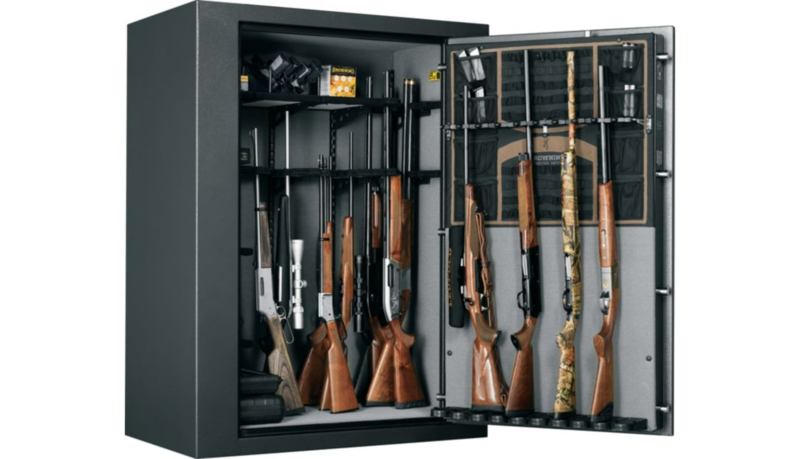 11-ga. steel body and large-diameter locking bolts provide added security, while the Axis Adjustable Shelving and included pistol rack with five-handgun capacity facilitates convenience and versatility. Two carbine barrel loops secure shorter rifles and shotguns to the door panel. 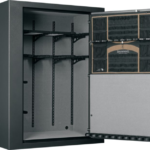 Premium DPX Storage System features a quick-access barrel rack with scope saver. 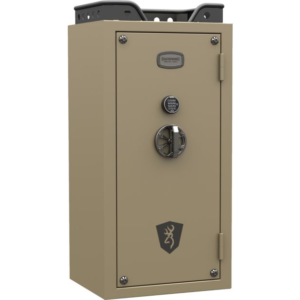 Force Deflector™ Locking System, hardened steel pin lock and pry-stop end bolts prevent entry and protect the SecuRam locking mechanism. 100-minute ThermoBlock fire rating at 1,680ºF. Elevated floor ensures your gunstocks stay protected. Internal electrical outlet is perfect for keeping essential gear, like GPS units and spotlights, fully charged and ready to go. 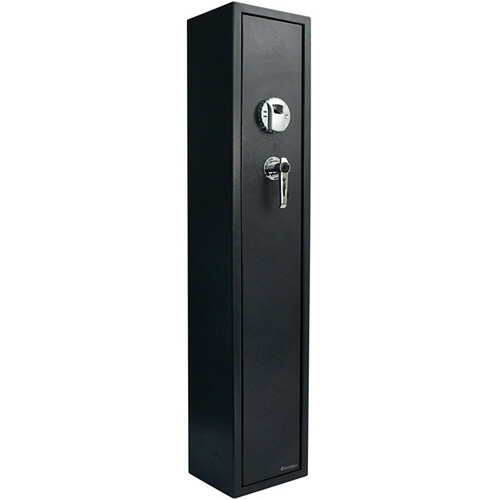 Rugged 1-31″ thick Duo-Formed® doors have partial inner plates, as well as 1.25″-dia. 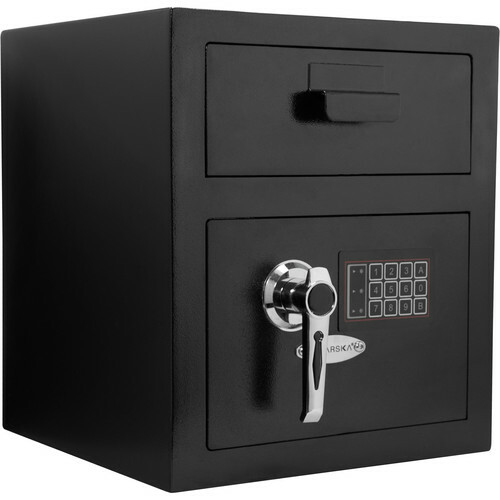 chromed locking bolts on the top, sides and bottom for added security. Decorative outer scroll detailing and pinstriping. Three-spoke chrome handle. Interior light package, semi-closed gear loft. Made in USA.